By John C. Toman. Posted September 2, 2012, 10:54 AM. The latest round of monsoonal thunderstorms brought another round of thunder and lightning and scattered showers to Riverside County's inland valleys on Thursday, padding the summer season's totals, which have been above normal in most Southern California inland communities this year. Most of the Thursday's action (other than in the mountains) spread north and south along the Elsinore Convergence Zone, from 2pm on, with a particularly heavy cell over the East Murrieta / French Valley area. East Murrieta reported 0.48", which was closely followed by French Valley with 0.47". Other significant totals in the WeatherCurrents network included Menifee (0.23"), Hemet (0.15"), East San Jacinto (0.12"), Wildomar (0.11"), Perris (0.07") and Beaumont / Cherry Valley (0.06"). 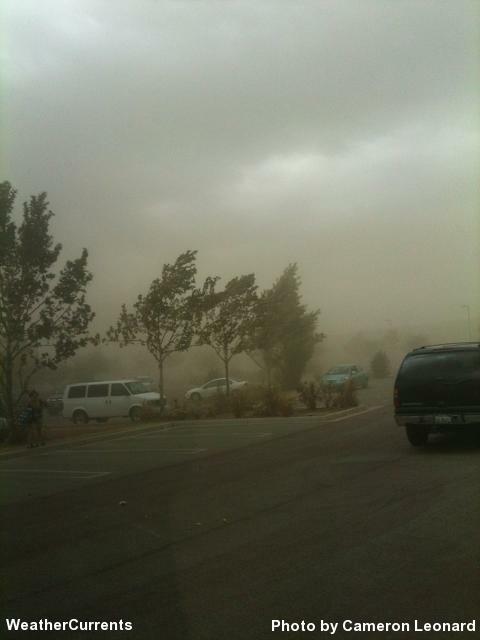 High winds were reported in the San Jacinto Valley. Monty Parrott reported they were in excess of 40 mph, and blowing dust was a problem. Further north, flooding was unexpectedly reported in Moreno Valley, although WeatherCurrents' station in the Sunnymead area received only 0.01". The flooding was several miles to the east, and closed Redlands Boulevard not far from the badlands, and sent mud and debris into streets and yards. Many location were outside the measurable rainfall zone, including Temecula, Fallbrook, De Luz, San Bernardino, Jurupa Valley, Riverside / Presidential Park, Simi Valley and San Diego / City Heights. For this summer's monsoon season, which normally runs into September, only WeatherCurrents' City Heights station in San Diego has not received any measurable rainfall. A duststorm, with winds of more than 40mph, precedes showers in the San Jacinto Valley. Photo courtesy of Cameron Leonard.